We were provided cloth diapers for review purposes. All opinions are our own. This post may contain affiliate links. I’m always happy to add new cloth diapers to our fluffy stash, so I was excited for the opportunity to try out Lil Bums cloth diapers. Lil Bums sent us 2 complimentary pocket diapers in their newest prints. The elephant print has a super soft minky outer that’s covered in cute colorful elephants. It’s not only super soft, but adorable as well. The other print is a fun gray and white chevron. 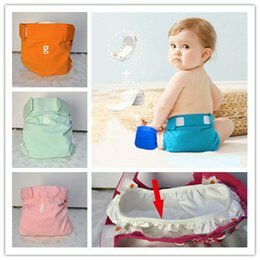 It’s outer is made of a silky polyester material, and Lil Bums advertises that this material makes it perfect to use the diaper cover as a swim diaper! 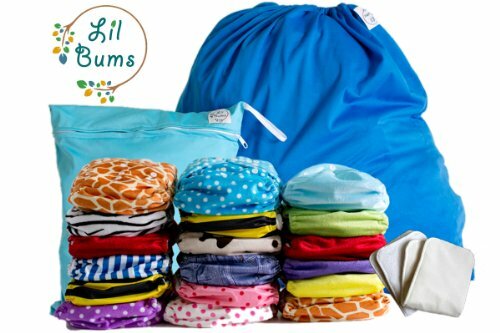 The inner linings in all Lil Bums cloth diapers are made of a soft stay dry suede lining, designed to wick away moisture, keeping baby as dry and comfortable as possible. 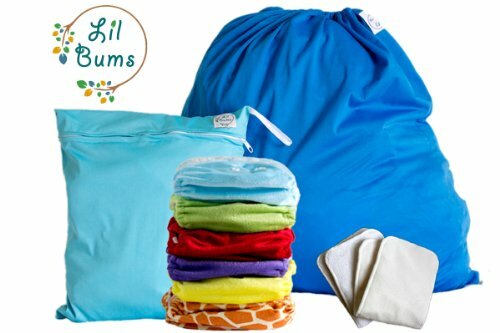 Lil Bums pocket diapers come with two inserts, one microfiber and one organic bamboo cotton liner. This allows you to customize the fit and absorption that suits your little one best. Their cloth diapers are one size, with snaps that adjust at the waist as well as the rise of the diaper. These diapers adjust to fit most babies and toddlers from 8 pounds up to 35 pounds. I love to see these super cute prints on William’s bum! I like that Lil Bums has several prints to choose from, even for a boy, as well as really bright solids. William is a pretty heavy wetter, so I have to use both inserts, which makes the diapers pretty bulky on him. I wish there was a thinner option, but the double insert doesn’t seem to bother him, or slow him down, as he’s always on the go these days! William is 11 months old and around 20 pounds; we have this diaper on the smallest rise, and the waist is snapped almost all the way. He is pretty skinny for his age though. It seems like the cut of this diaper is pretty generous, so I think it would be a good choice if you have big or tall babies, and will likely fit nicely until they are potty trained. 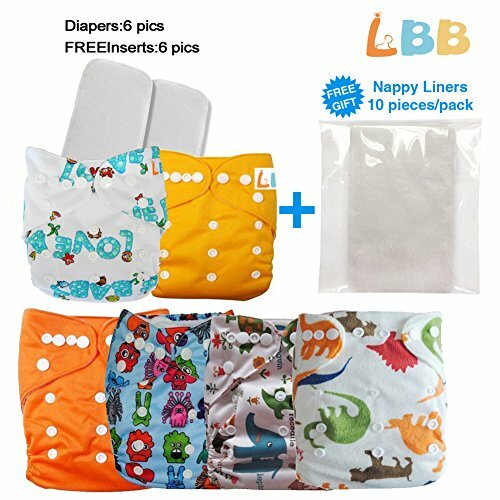 Lil Bums diapers retail for $12.99 each, with both inserts included. 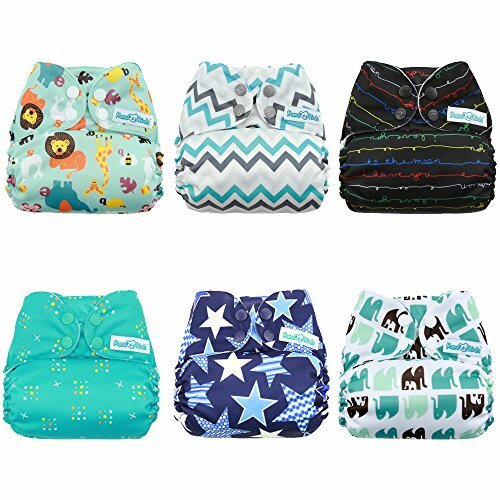 They also offer a discount on cloth diapering starter kits that come with 6, 12, or 18 diapers, along with travel wet bag, and pail/hamper liner. Head on over to Amazon.com to see all cute prints, especially if you have little boys. I think you will be pleasantly surprised! What’s your favorite Lil Bums cloth diaper print or color? Chevron and elephant are my favorites! Love the Chevron print!! So cute! I love the Jeans PRINT. sO CUTE. I like the Lil Bums One Size Cloth Diaper – Animal print. the elephant print is the cutest! I like the white & pink polka dots. I like the purple polka dots best. I love the lil bums Elephant print! My favorite print is the animals print with the lions on it! Elephants are my favorite animal, so that on is my favorite print as well. They are all so cute! Love the chevron! I love the animal print! too cute! I really like the dinosaurs or elephant prints! I like the animal print best! The elephant print is cute!! The elephant print is adorable! I like the chevron print and the blue polka dots print. I love the options for boys!! With expecting our first (a boy) it was nice to find some more boy friendly prints! I love the elephant print from Lil Bums! Gray chevron as that is the theme of our nursery. My favorite print is Chevron. I love the bumblebee print! Super cute! I love both the animals and the elephants, what cute designs!!!! I love the elephants print! so cute! I really love the cow print! My favorite Lil bums is the bumblebee print! I love the elephant print!! Fingers crossed! I love them all but I really like the elephant. So cute! I love the Mixed Blue polka! I love the dinosaur print. toooo cute. Animal is such an adorable print, but the orange is perfect for a UT game. I am in love with the elephant print. I really appreciate that this company has several good boyish options. Too many companies have a ton of girly prints and neglect the boys! I like the bumble bee print! I liked the chevron print. I love the elephant print. I just love The elephants. I like the blue polka dot print! I love the Pink Polka Dot print! i THINK THE Lil Bums One Size Cloth Diaper – Cow IS SUPER CUTE! I’m hoping to start cloth diapering, but my husband is going to be difficult to convince. I love the cow print! it is so cute! I think the lil-bums Animal print is my favorite! I like the white and pink polka dot. One size fits all. I LOVE the elephant print! I also think all of the polka dots are super cute! The elephant print is too cute! I love the giraffe print. Thanks! I like the Lil Bums One Size Cloth Diaper – Blue Polka Dot. Elephants is my favorite print, but Dinosaurs is a close second! The bumblebee print is adorable! But I love them all! I like the blue color the most, it would match our nursery! I love the cow print diaper. I love all the polka dot prints – so cute! the elephant print is adorable!! great gn options! Mixed blue polka dot is my favorite! I think the Dino print is my absolute favorite! Soooooo cute! I like the bumble bee print.